The flooring will always have an important role to play in a room’s design and the material should match the requirements you need. Whether you’re redecorating or renovating a room, upmost attention should always be given to the floor. Carpeting is often chosen for rooms where comfort is required, such as the living or dining room. But this household favourite just wouldn’t be worthwhile in the kitchen or bathroom. For both rooms, you’ll want something hardwearing, durable and water resistant. Floor tiles offer all three of these and much more. When it comes to flooring, there isn’t much on the market you could find that’ll beat tile for cost. With a range of products you can select a product that meets your budget and still benefit from a wealth of advantages. Your bathroom and kitchen flooring are bound to attract dirt and grease so it’s important to have a material that’s easy to clean. 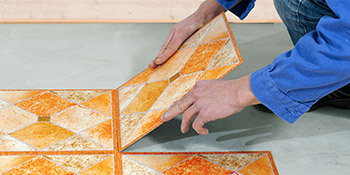 With floor tiling you’ll be able to wipe, mop or brush the surface quickly to make it look as good as new. Kitchens and bathrooms are used throughout the day and need to be resistant to water damage, impacts and heavy use. With tiled floors you’ll have something that will last for years with little maintenance. Tiles allow you to pick and choose a design that matches your existing style and looks fantastic. From the decorative designs to plain finishes, you’ll find something that meets your budget and will provide you with a fantastic finished look. With floor tiles you’ll have a product that’s easy on the eye, durable, hardwearing and impact resistant. On top of this you won’t have to spend big to take advantage of tile flooring. For up to four FREE quotes from vetted and reputable companies in your area, just complete our quick form below. Properties are given an energy rating dependent on exactly how efficient they are and ratings are shown in the data underneath. This ranges from A, the most energy efficient, to G, the least efficient. With a higher rating you're more likely to have less expensive energy bills as more heat will probably be kept in the home. You are able to improve your home's efficiency with insulation including upvc double glazing, loft lagging or wall cavity insulation. The information below reveals the various types of homes within Uk. The most commonplace houses all around the United Kingdom are detached and semi-detached homes. Other kinds of homes encompass terraced houses, flats, converted flats and bungalows. The data listed below offers an indication for the number of households in Uk that are central heated and non-central heated. Houses are heated by a number of sources which reflect how pricy yearly energy bills are going to be. Types of central heating include gas, electricity, oil, solid fuel and LPG boilers. Changing the way in which your home is heated could see you with cheaper bills. The data underneath illustrates the spread of houses heated by various fuels. Throughout the UK the most frequent undoubtedly are gas heated properties, followed by electricity and then oil. Biomass central heating boilers are also increasing in popularity, heated by sustainable products such as wooden pellets or agricultural waste.|Homes in Britain are heated up by a number of fuels, which include gas, electricity, oil, solid fuel and LPG boilers. Each fuel has a varying cost associated with it which means you could find yourself with less expensive energy bills by switching how your household is heated. Even solar thermal panels are being regarded as by many in order to cut heating bills for the many years to come.